I’ve read a few of the Quarry novels featured in the Hard Case Crime series and they are always a hard-boiled pleasure. Rich pulp at its finest, Quarry is a captivating antihero despite his predictable qualities of a good conscious down deep, a pride in his work, and that weakness for women. Coupling his wit with sleazy, sinister characters up to no good, you have all the ingredients for a good noir. Compared to other books in the series what is enjoyably unique about this one is just how far off course the character of Quarry is driven by being fooled into losing sight of who the bad guys are, and the truth behind the situation in which he find himself. Knowing that our protagonist assassin is on the trail of the ‘wrong quarry’ ruins the surprise of the existence of this final twist in the novel, however the interesting aspect for the reader switches from being about the existence of the twist to more about how Quarry is being fooled. 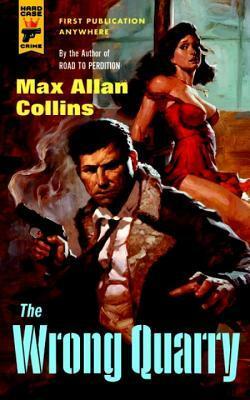 Overall another great entry into the Hard Case Crime series, a novel that takes retro pulp trashiness and delivers a pure little guilty pleasure for fans of the genre.